Taking care of your own teeth is important, but you also need to keep an eye on the dental health of your dog. After all, they can’t exactly brush, floss, or use mouthwash for themselves. Proper dental care goes a long way towards keeping your furry pal happy and healthy. So here’s a quick look at what you should do. Proper dental care goes a long way towards keeping your furry pal happy and healthy. Any plaque on your dog’s teeth will eventually turn into tartar. If this is unpleasant for you, just imagine how bad it is for your pup! 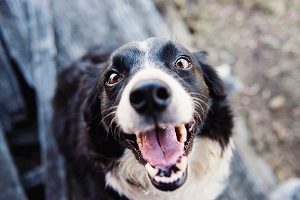 You might start to notice something is wrong when your dog always has bad breath, has sensitive teeth, or teeth that are starting to fall out. Eventually infections and disease will spread out and affect other parts of your dog’s body. If you spot these problems, keep an eye out for other health issues. These behaviors or signs might be easier to look for, since they’re more readily apparent. These include avoidance of chewing their food, crying when they are eating or about to eat, red or bloody gums, and loose teeth. One way to help start a routine for dental care is to brush your dog’s teeth. After all, you probably help brush your kids’ teeth when they are too young to do it for themselves, and this isn’t that much different. Brush their teeth every two or three days for best results. You can even give them chew toys that function as toothbrushes, too! If you’re unsure of what to do, or you don’t see any improvement, then it could be time to bring your four-legged friend in and see the friendly professionals here at Alexander Animal Hospital! This entry was posted on Friday, February 8th, 2019 at 5:09 pm. Both comments and pings are currently closed.